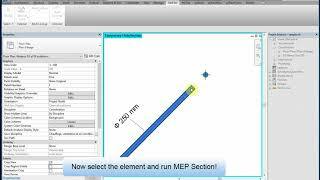 Section Plugin for Autodesk® Revit® enables users to draw a section around simple MEP curved objects (like pipes, ducts, cable trays, and conduits) easily without any effort with just one click! Select an object and then use this plugin to make a section so easily or, have your selection and then click on the section icon of the plugin and the section is drawn and opened. Section line is drawn automatically parallel to the object’s direction. The size of the section box is calculated from the selected object’s bounding box. There is an option that deletes the section after it has been closed. You can also set the default configuration of the section in the config tab of the plugin. Illustrated in the screenshots. The installer that ran when you downloaded this app/plug-in from Autodesk App Store will start installing the app/plug-in. OR, simply double-click the downloaded installer to install the app/plugin.To uninstall this plug-in, exit the Autodesk product if you are currently running it, simply rerun the installer, and select the "Uninstall" button. OR, click Control Panel > Programs > Programs and Features (Windows 7/8.1/10) and uninstall as you would any other application from your system. Offset ,depth,dialog box keep values fixed.